Add to Dashboard: Selecting this will bring you to the New Widget page, where you can select what does and does not display using the check boxes on the right. This includes the name of the even, which can be edited, a play button to quickly run the event, and the option to confirm that the event will run before running it. You may also select which dashboard the widget is added to. 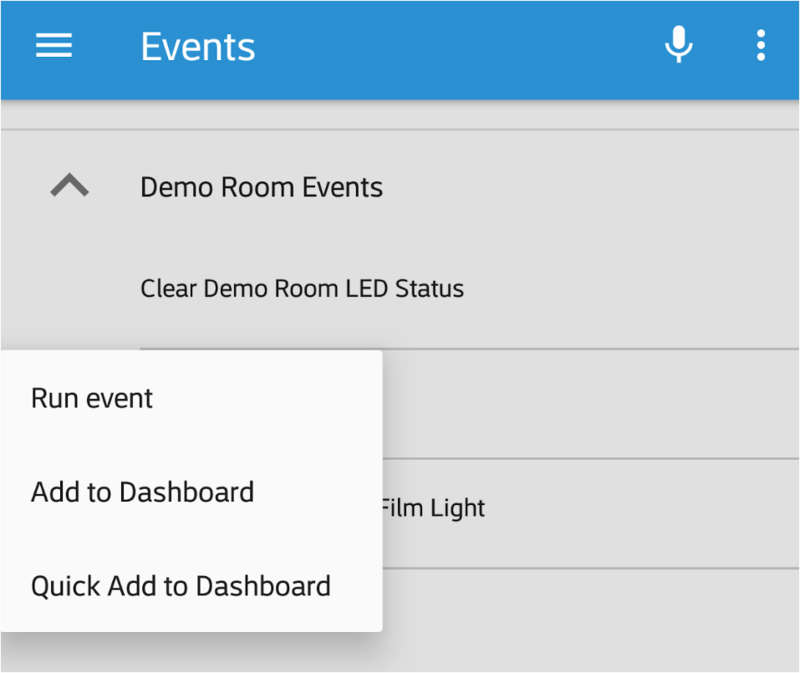 Quick Add To Dashboard: This option adds an event to your dashboard immediately. The only option to choose from is which dashboard to add the widget to, if you have more than one. Add to Dashboard: Selecting this will bring you to the Create/Edit Event Widget page, where you can select what does and does not display by tapping the eye icons. The name of the widget for this event can be edited by clicking the pencil icon by the event's name. You may also select which dashboard the widget is added to and resize it.